Condoleezza Rice is taking responsibility for the troubled U.S. occupation in Iraq right after Saddam Hussein was overthrown. 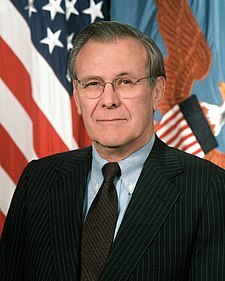 Rice was President George W. Bush’s national security adviser when the war began in 2003. She says it wasn’t former Defense Secretary Donald Rumsfeld‘s fault that things went badly when the U.S. began to occupy Iraq after driving out Saddam. She says military operations went very well in removing Saddam from power. But she says the U.S. did not have what she calls the right structure in place to handle the occupation. Rice says the Bush administration put a single department — the Pentagon — in charge of running Iraq. Rice — who’s now secretary of state — says that wasn’t the right approach. You are currently browsing the archives for the problems category.